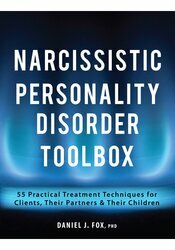 Invaluable tools you need to treat clients on the narcissistic spectrum, AND help their partners and children grow beyond the hurt and pain. Daniel J. Fox, PhD, has been treating and specializing in the treatment and assessment of individuals with personality disorders for over 15 years in the state and federal prison system, universities, and private practice. Dr. Fox is a national trainer and author of The Clinician’s Guide to The Diagnosis and Treatment of Personality Disorders and the award-winning Antisocial, Borderline, Narcissistic and Histrionic Workbook.